A prepayment or deposit, is any money taken in advance of a check out. This is dependent on your hotel's policy for charging guests. If you're using the Xero integration, you'll need to make sure that you've mapped the Deposit account in Preno to one in Xero (this can be done in Settings & Preferences > Integrations). To add a prepayment, deposit, or create an early invoice, select the booking on the grid. 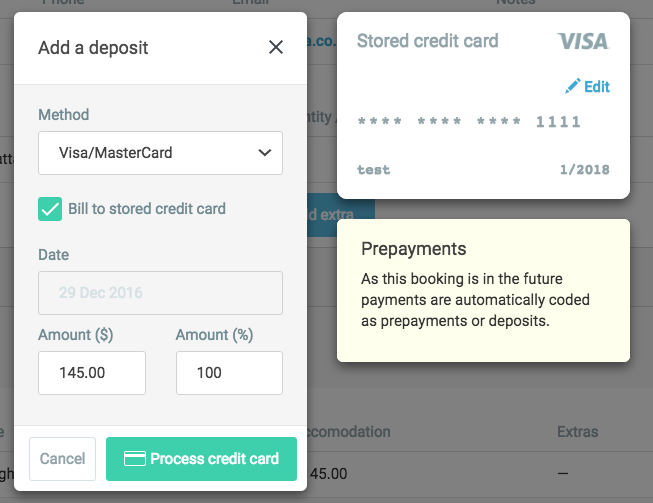 Note that you can only add deposits to future bookings. Select Add deposit, and you'll be taken to the payment screen. Select the payment method that you'd like to record. You'll have a few options in the drop down, including Cash, Credit Card, invoice and direct credit. Select the method that your guest will be paying by. You can change the amount that you're taking as a deposit, including just taking a percentage of the booking. Then select Add Payment. Note: You can have multiple prepayments or deposits for each booking. Locate and open up the booking that you want to add a deposit. Scroll down to the bottom of the booking to find Charges & Payments section. Click "Add deposit/create invoice" and a payment screen will appear. Select the payment method for the deposit and adjust the amounts. Click Add, and Preno will create a draft invoice in Xero. If you aren't using Xero, the payment will still be recorded. You can add a deposit by charging the guest's stored credit card if you have added the guest's credit card to the booking. To do this, you need to enable the integrated credit card payments in your Preno account. Head to the Payments section of the booking, and click on "Add deposit/create invoice". You will then see the payment screen like the one below. Adjust the amount and click "Process credit card" to add the deposit. With Preno, you can only charge an agent for the full amount of the accommodation. You can include extras if you've set them up to charge the agent. Follow the same steps you did above, and Preno will automatically come up with the full amount for the reservation for charging the agent. Click Add, and Preno will create a draft invoice in Xero for you to send off to the agent. If you aren't using Xero, a PDF will be generated. You can download the PDF invoice by clicking on the payment.